After you have learned how to do the traditional wagering of Win Place and Show the next step is to learn about exotic wagering. There are several different types of exotic wagering to bet on, which is a little more challenging. You need to figure out what horses to bet on and in what order they will be finishing the race or in multiple races. 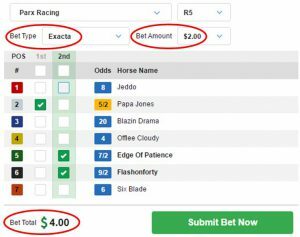 Let’s take a look at a few exotic wagering strategies, starting with everybody’s favorite, the Exacta Bet. Straight: You choose 2 horses and they must finish first and second in that order to collect your winnings. For this example, we will single out a horse to win. In this case, the #2 horse to win the race followed by two others (#5,#6) to finish in second. This example costs $4.00 to play therefore keeping the overall cost of the bet down. However, the #2 horse must win the race and either the #5 or #6 horse must come in second. Box: You choose 2 or more horses and they can finish first or second in any order to collect your winnings. Example: In this scenario, we will use the same horses (#2, #5 and #6). Any combination of them can come in first or second. 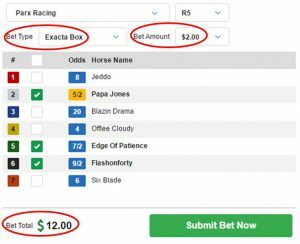 By boxing all three horses, a simple $2 Exacta Box increased the cost of the bet to a total of $12. A boxed bet will always increase your bet total. 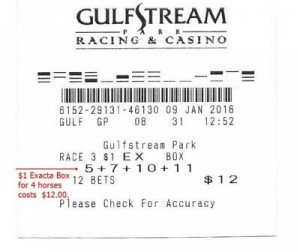 The following ticket is an example of using 4 horses (5,7,10,11) in an Exacta Box. 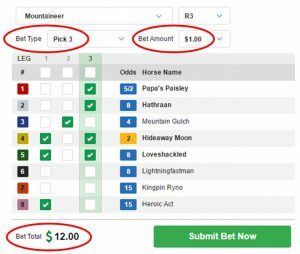 For a $1 bet, the cost is $12 while a $2 bet would cost $24. For this example, we will again use horse #2 #5 and #6. Straight: You choose 3 horses and they must finish first, second and third in that order to collect your winnings. An Example: So in this scenario horse #2 must finish first, horse #5 must finish second and horse #6 must come in third. With a simple $1 wager this bet would cost a total of $1. Box: You choose 3 horses and they can finish first, second or third in any combination to collect your winnings. Example: So in this scenario horse #2, #5 and #6 can finish in first, second or third as long as they finish the race as the top 3. 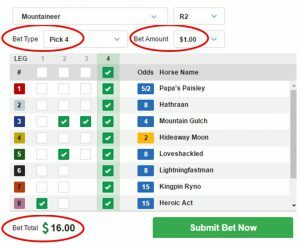 With a simple $1 Trifecta Box wager, this bet would cost a total of $6. 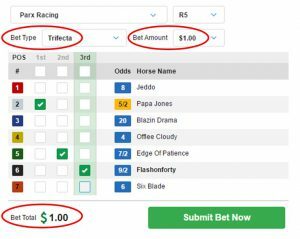 The majority of the tracks offer $0.50 trifecta wagering which cut the betting total in half ($3 for the example below). However, keep in mind the winning amount will also be cut in half too. 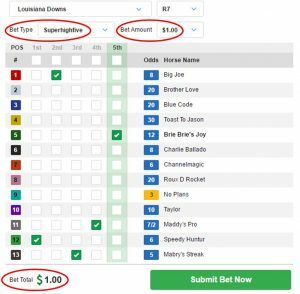 Notes: Of course anytime you throw additional horses in the mix, your bet ticket will increase. Listed below are examples of the costs to do so. You can easily see how the costs increase when you throw in more horses. Boxing horses can be very expensive! 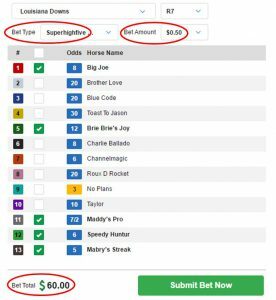 For this example, we will use horse #4,#5 #6 and #7 in Superfecta Straight wager. Straight: You choose 4 horses and they must finish first, second, third and fourth in that order to collect. Example: Say you like the #4 to win the race, the #5 to finish second, the #6 to finish third and finally the #7 to finish fourth. Again, it has to finish in that order (4,5,6,7) to collect the win. A straight type of bet keeps the cost way down but is very difficult to hit although, on occasion, it can be done. 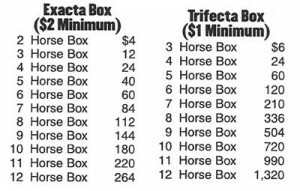 Box: In this example, we are using the same combination of horses (#4,5,6,7) in a Superfecta Box wager. All 4 horses can finish in any order as long as they’re all in the top 4 crossing the finish line. 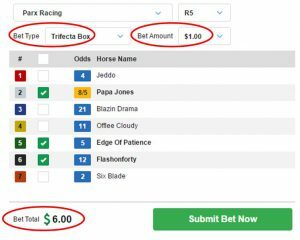 Most tracks offer $0.10 Superfectas which keep the cost of your tickets down and can still lead to a nice payout. Ten cent Superfectas are very popular to play. Most tracks offer $0.10 Superfectas which keep the cost of your tickets down ($2.40 for this example). If you changed the bet amount from $0.10 to $1.00, the cost of this bet is $24 total. 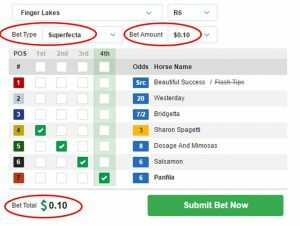 Now you know why people love the $0.10 Superfecta! For this example, we will use horse # 1,5,11,12, and 13. Straight: You choose 5 horses and they must finish first, second, third, fourth and fifth in that order to collect. Example: So in this scenario horse # 12 must finish first, horse # 1 must finish second, horse # 13 must come in third, horse # 11 must finish fourth and horse # 5 must finish fifth. With a simple $1 wager this bet would cost a total of $1. Again, a very low-cost form of wagering but very hard to hit straight! Box: You choose 5 horses and they can finish first, second, third, fourth and fifth in any order to collect. For Example: So in this scenario, horse # 1,5,11,12, and 13 can finish in any combination of those numbers (120 possible combinations). With a $0.50 wager, this bet would cost a total of $60.00. Increase the bet amount to $1.00 and the cost of this ticket doubles to $120.00! Adding more horses to a Super High Five boxed ticket can get very, very expensive. There are other types of exotic wagering that can turn you into an astute handicapper with huge payout possibilities. These types of wagers I would consider for the experienced handicapper that has been betting for a while. Once you get into betting on multiple races on one ticket it can also get expensive as well. The following are examples of wagering on consecutive races, picking only winners and with one ticket. Your Horses must win two consecutive races. In the example below, the first leg of the Daily Double (Race 8), the #2,#4 or #5 horse must win the race. 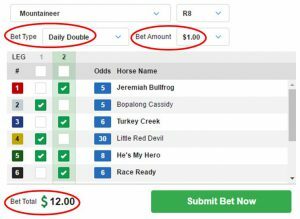 In the second leg of the Daily Double (Race 9), one of the following horses must win the race; #1,3,5,6. If any of the horses you’ve chosen to win in both races, you’ve hit the Daily Double! The horses you select must win three consecutive races. In this example, the horses selected in the first leg are #4,5 and #8. You’ll notice in Leg 2, there is only one selection, the #3 horse. 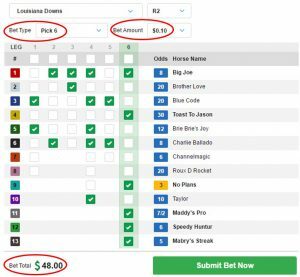 By singling out a horse in one of the legs, you’ll keep the overall cost of the ticket down however that single pick has to win that particular race. If you get past that leg, you’ll notice you have 4 possibilities (#1,2,4,5) in the final leg of the pick 3 and a higher percentage of winning the Pick 3. Your Horses must win four consecutive races. Same kind of theory on any of the Pick # tickets. Notice a single is played on both the first leg and the third leg of this ticket. If you get past all three legs, the All button was selected in the last leg. Hope for the longshot in the last leg, you have it covered no matter what. Your Horses must win five consecutive races. Again, same kind of theory but adding a 5th race to the equation. A winning ticket on a pick 5 can occasionally pay off with a comma after the first digit!! Your Horses must win six consecutive races. This is like playing the lottery!!! Again, it can happen and it may get a bit nerve wrecking if you can get past half of the Pick 6. Good Luck with this one!!!! Hit a big Pick 6 and get used to the letters IRS !! 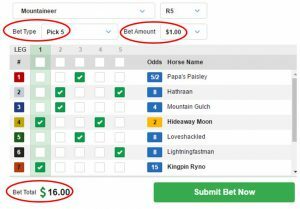 Exotic Wagering can be tough to hit because you are trying to pick the horse that is going to win in consecutive races. It hard enough sometimes to pick one winner for a single race let alone a winner in 3,4,5 or 6 races! Player beware these types of wagering are for the more experienced handicapper. But if you ever want to try your luck at it start off with the minimum wager amount. I have read several books to help educate myself on becoming a better handicapper especially when it comes to exotic wagering. Here are a few reviews on the books, check them out on the Inside Track page. 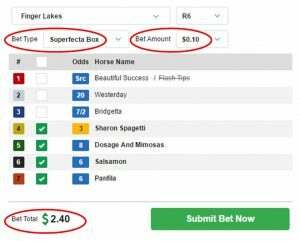 If you would like to see the results from horse racing wagering including the traditional to exotic wagering go to our Horse Racing Betting Results page.